Sabi Sabi Private Game Reserve, nestled in the world-renowned Sabi Sands Private Game Reserve, boasts over 40 years of excellence. 3Sixty Luxury Marketing is proud to add Sabi Sabi to our portfolio and market the four unique luxury lodges loved for providing guests with a variety of experiences to choose from, depending on their personal preferences and needs. 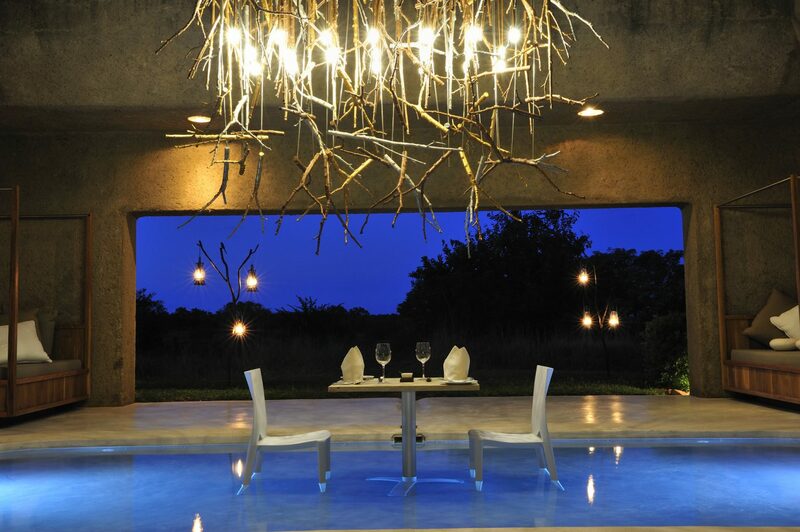 Sabi Sabi’s prime location in the Sabi Sand Reserve makes it a recognised ‘hot spot’ of biodiversity. Morning and evening safaris are enjoyed in open safari vehicles with highly experienced rangers and Shangaan trackers. Environmental awareness walking safaris add an extra dimension to the bush experience, allowing a close-up look at the fascinating smaller creatures of the bushveld. 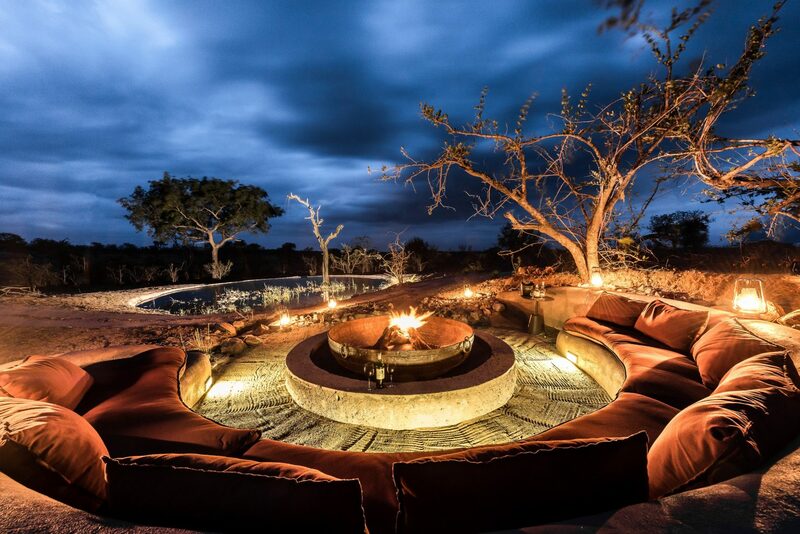 All four lodges are members of the National Geographic Unique Lodges of the World and offer the very best of luxury, safari, dining and hospitality. Sabi Sabi offers a true culture of caring when it comes to guests, wildlife and the local communities. 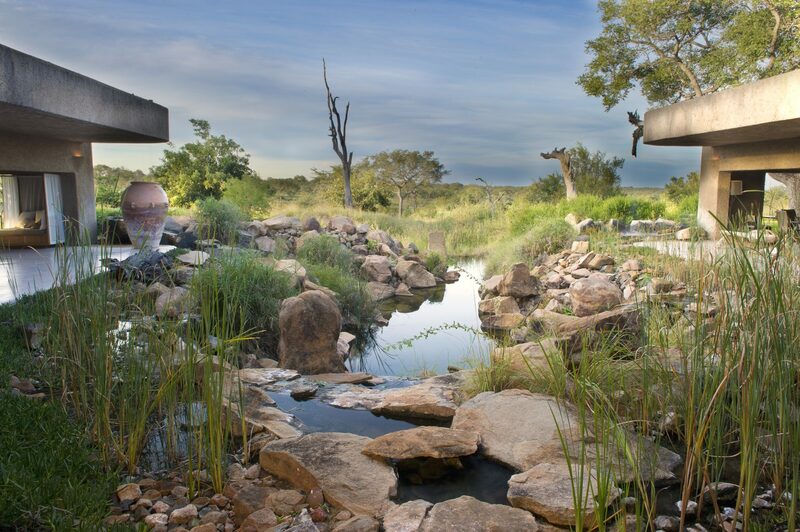 Earth Lodge, a true masterpiece of innovative architecture, organic design and dramatic minimalism which are the cornerstones of this award-winning and internationally renowned game lodge. 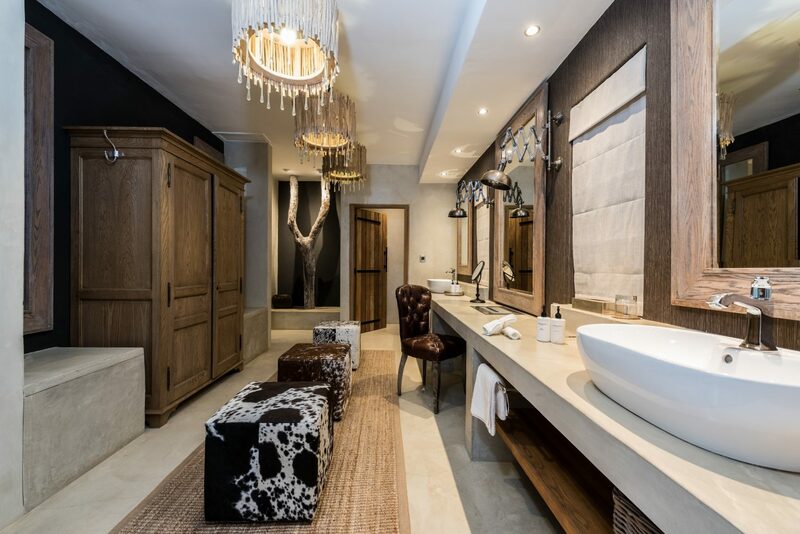 The lodge has 13 ultra-luxurious suites, each with a private plunge pool, en-suite glass fronted bathroom, outdoor shower and specially commissioned furnishing. 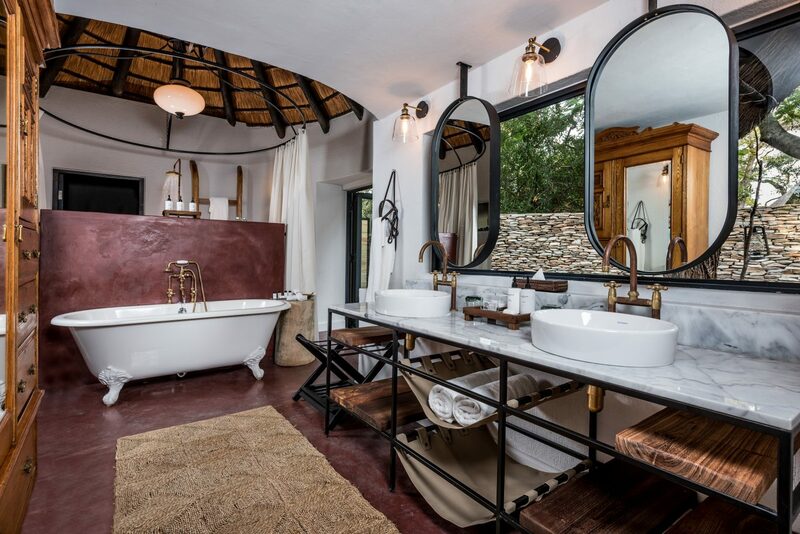 The clean lines and natural finishes form the perfect foundation for the luxury, grandeur and lavish touches that epitomise Earth Lodge. As in nature, everything at Earth Lodge exists in harmony and visitors are immediately aware of a sense of calm and a restorative spirit. The indoor-outdoor dining area overlooks a waterhole and unending bush, and the lodge boasts a library, wine cellar, unique day bar, gym, sunken fire-pit lounge overlooking the wide open bush and the holistic Amani Spa. Earth Lodge offers the very highest standards in international hospitality – Sabi Sabi’s thrilling safaris with close encounters of Africa’s wildlife, luxury accommodation, gourmet food, unparalleled warmth and service, and the uniquely original aesthetics of Earth Lodge. This is the past, present and future of nature – this is Earth Lodge. Little Bush Camp takes its rightful place amongst the four iconic lodges of Sabi Sabi Private Game Reserve’s “Yesterday, Today and Tomorrow.” This intimate and secluded camp seamlessly bridges the space between the contemporary ‘Today’ and the avant-garde ‘Tomorrow’. Hidden under ancient riverine trees, on the banks of the Msuthlu Riverbed, Little Bush Camp’s six private suites have been fully refurbished and re-designed. Inspired by the African continent, the aesthetics of our diverse African culture were infused into the décor, creating an ambience of ‘African Adornment’. 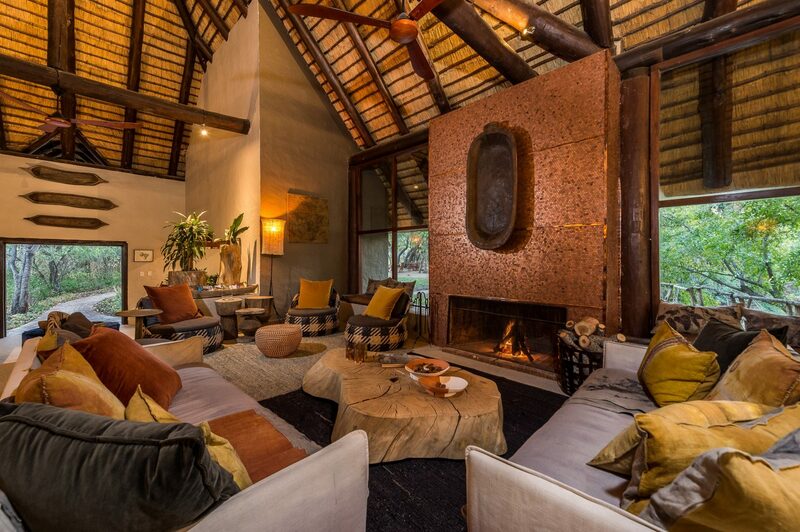 The dramatic architecture of the central reception, lounge and dining areas, with its sweeping high thatched roof with huge wooden beams that cover the entire structure, is now a wonderful frame through which to view the bushveld beyond. There are unexpected and wondrous design elements which begin right at the reception desk, and follow through allowing the eye to gently follow the glittering quartz floors, to the various intimate lounge areas and the unique signature conversation piece – a floor to ceiling shimmering mantel, totally clad in individual copper 5 cent coins. The wrap-around bar area, with its drop-down canvas and leather awnings in case of inclement weather, boasts exquisite new furniture in keeping with the edgy new style and is just perfect for the delicious cuisine, and cushioned hanging chairs suspended on the outdoor deck are a fabulous spot to gently sway while listening to the sounds of birdsong. Once the little brother of the Sabi Sabi group of lodges, Little Bush Camp has become a joyous celebration of African adornment and character, an intimate luxurious camp with a style all of its own. In the waning light of the late 19th century, the first railway lines snaked through the Mpumalanga Lowveld, built to carry gold from Phalaborwa to Lourenço Marques in Moçambique. Further south, on the Selati Line, passenger trains slowly chugged into Newington Station, with conductors peering up into the trees against which were long ladders – provided by the railway company to enable travellers to climb to safety, away from the marauding lions which prowled the area. Born of history, inspired by the legends of hidden bullion and fearless hunters, the exquisite seven suite Selati Camp is a tangible reminder of this grand steam train era, and epitomises the ambience of yesterday. Each of the suites, romantically named after long-gone railway stations, is intimate and comfortable. “Vintage” styling, en-suite bathrooms, and cleverly concealed air-conditioning and electricity maintain the historical theme. 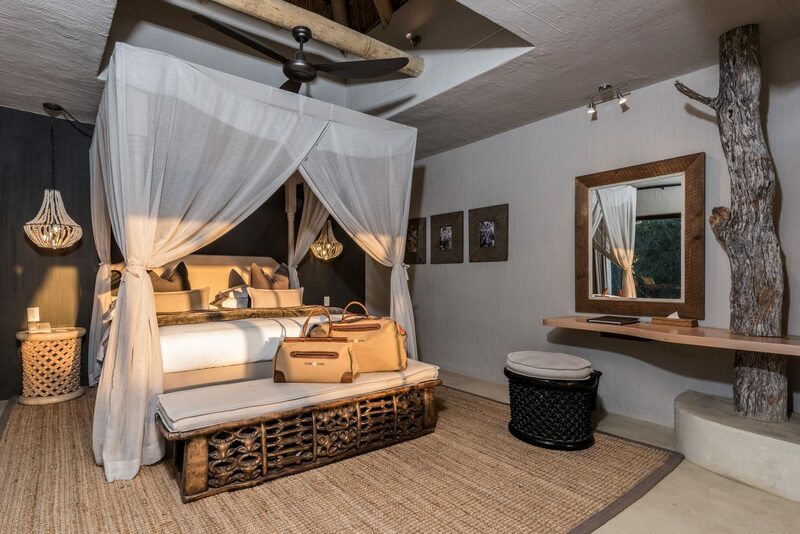 The Ivory Suite, with its four poster bed, enormous bathroom and plunge pool, comes complete with a private open safari vehicle. Nights at Selati are illuminated by the gentle glow of authentic shunters’ lamps and lanterns. 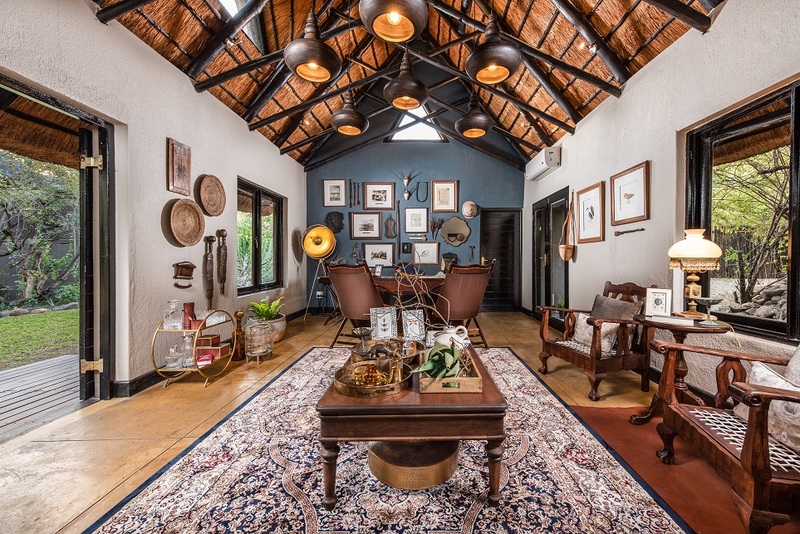 The historically themed lounge and bar area are filled with reminders of times gone by and this intimate haven opens up to the outdoor boma, where superb meals are enjoyed under the star-studded African sky or in the intimate “Farmhouse Kitchen”. Armchairs around the sparkling pool or on the covered wooden viewing decks are a perfect perch from which to watch game drinking at the nearby waterhole. Imagine the Africa of the great safari era, when blazing sunsets melted into lantern lit romance and service was an effortless whisper – this is Selati Camp. 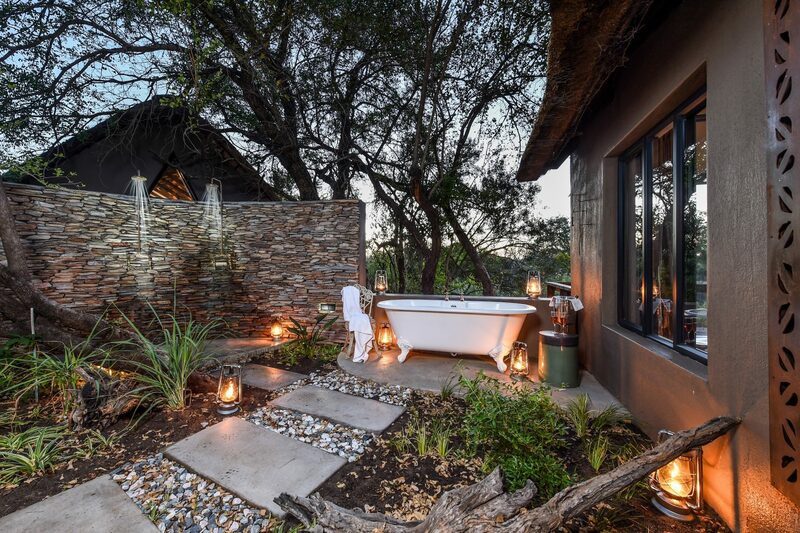 The philosophy of Bush Lodge has always been that of a “luxury home in the bush” and this is more than evident today as the new Bush Lodge takes you on a breath-taking expedition through Africa, celebrating its people, its art and culture. The contemporary style is exciting with a vibrant mix of furnishings garnered from all corners of the continent. 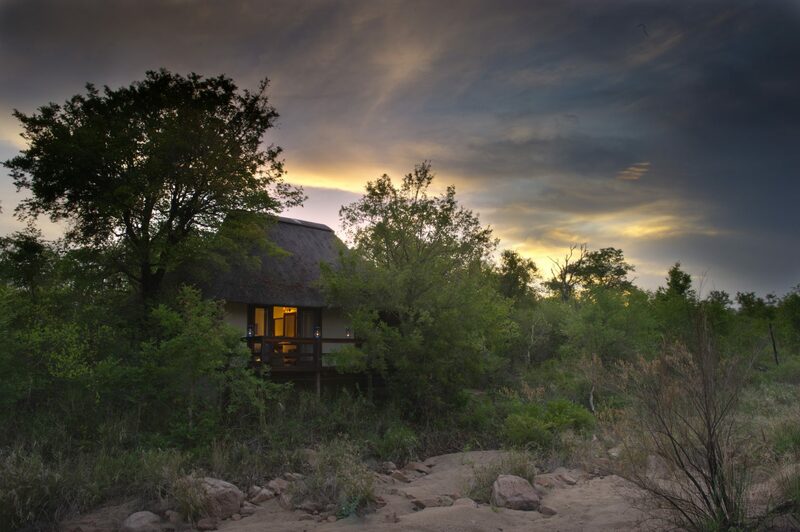 Bush Lodge has been sensitively designed to allow ample space to relax, unwind and savour the tranquillity of the bush. There are two swimming pools to enjoy in the heat of the day while the expansive covered viewing decks and lounge areas, with groups of intimate seating areas in a mix of cultures, are the perfect spots to enjoy watching wildlife meandering to the waterhole. 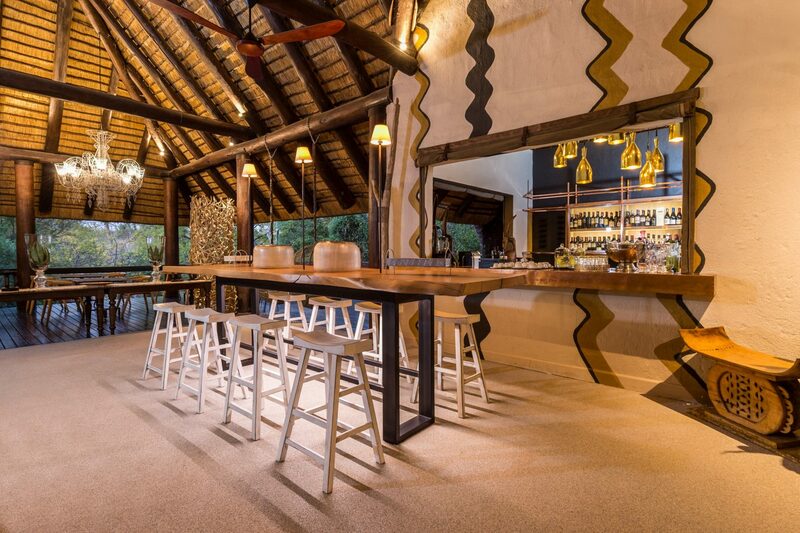 The bar area is quirky and classical, featuring a wide selection of craft beverages while the safari dining area, with its high thatched ceiling, is a central area where one can enjoy superb cuisine. As an extra indulgence, the Amani spa at Bush Lodge offers the ultimate African Spa experience. The lodge has 25 luxury suites in total including two Luxury Villas and the Mandleve Deluxe Suite. Bush Lodge is family friendly and children of all ages can enjoy the EleFun Centre, a fully-fledged children’s facility. Interesting environmentally themed activities, including hands-on ‘edutainment’ for several distinct age groups, are designed and supervised by qualified childcare professionals. The beautifully planned centre is strategically placed within the lodge environs, minimising any disturbance to the adult guests. Parents can relax and enjoy some private time, knowing that their children are safe and happy, revelling in their own, age-appropriate, fun-filled bushveld experience. Natalie Mietz, who has over 20 years’ experience in the hospitality industry, has developed a true love and appreciation for beautiful spaces and places. Her most recent passion has led her to Sabi Sabi where she has been promoting the authentic experience of the lodges throughout the UK.